You are here: HomenextTopicsnextViews of the city: images & opinionsnextMystery photos of Brighton and HovenextA mystery solved! I travelled to Hove today to to see what the building looked like now and I’ve no doubt whatsoever that they are perfectly correct in stating that it’s 85 Portland Road Hove, although it has lost the character now that it had in its earlier years, I would have liked to have had an assistant who works in the shop now in the photo that I took today but unfortunately although it’s a Saturday the shop was shut! Thank you once again Julie & David for helping me to solve this query. I guess Mike was away on holiday when you visited on that Saturday. He is one of a few left that actually repairs all sorts of electronic items these days, as most new are made in China or similar whatever the badge name. Those new items don’t come with repairable circuits or parts so why we see many ‘new’ TVs etc at the tip. If you have ‘old’ equipment, Mike and a few others can still often repair it. As for the shop, inside and through the back it’s almost untouched and the stairway to the flat above is a good storeroom. Hi. 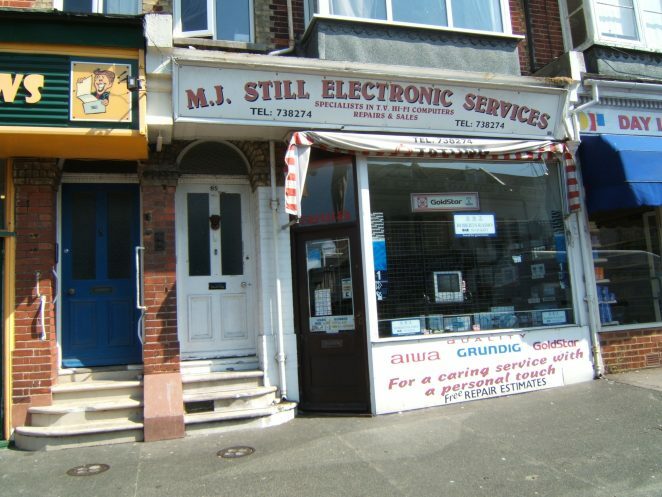 If the person who took this photo looked on the shop door, you would have seen a notice explaining that, due to Mike indeed being on holiday, the shop was only open for limited hours. Normal hours are displayed on the door, and Saturday & Wednesday are half day closing. Mike has moved to his own shop in Lancing after paying rent as a leaseholder at this site for many years. Looking after musical equipment now more than the TVs.